In the winter months the Rusty Grakle is found as far south as Lower Louisiana and the Floridas, which it reaches in small flocks, along with the Cow Bunting and Red-winged Starling, with which it continues frequently to associate until the return of spring. At this season it occurs in all the Southern and Western States, as well as in the Middle and Eastern Districts., where some remain during the most severe cold. These Grakles are fond of the company of cattle, and are seen with them in the pastures or in the farm-yards, searching for food among their droppings, and picking up a few grains of the refuse corn. They are less shy than the other species, possibly because less acquainted with man, as they retire to the north for the purpose of breeding. In the winter they frequently resort to moist places, such as are met with round the ponds and low swampy meadows, where you sometimes find a single one remaining for weeks apart from its companions. They then feed on aquatic insects and small snails, for which they search diligently among the rank reeds or sedges, which they climb with great agility. Their note is a kind of chuck. It is rare to meet with them in full plumage at this time, even the old males becoming rather rusty, instead of being of a pure glossy black, as they are in spring. About the beginning of March, the males are seen moving northwards. They cross the greater part of the United States almost in silence and unheeded, seldom tarrying any where until they reach the State of Maine, where some few remain to breed, while the greater number advance farther north. I saw some of these birds on the Magdeleine Islands, in Newfoundland, as well as in Labrador, where many breed. Their migrations are performed by day. In their habits they resemble the Red-winged Starling, becoming loquacious at this season, and having a lively and agreeable song, although less powerful in tone than that of the species just mentioned. Equally fond of the vicinity of meadows or moist places, they construct their nests in the low bushes that occur there. The nest is not so large as that of the Redwing, but is composed of much the same materials. In Labrador I found it lined with moss instead of coarse grass. The eggs are four or five, of a light blue colour, streaked and dashed with straggling lines of brown and deep black, much smaller than those of the Redwing, but in other respects bearing a considerable resemblance to them. They begin to lay about the 1st of June, in the State of Maine, and fully a fortnight later in Labrador. They raise only one brood in the season. The young, when first able to fly, are nearly of a uniform brown, brighter on the breast and shoulders. Although they seem to prefer alder and willow bushes, for the purpose of incubation, I have found their nests among the tall reeds of the Cat's-tail or Typha, to which they were attached by interweaving the leaves of the plant with the grasses and strips of bark of which they were externally composed. During early autumn, and before they remove southward, they frequently resort to the sandy beaches of lakes, rivers, and the sea, in search of small testaceous mollusca and aquatic insects. They do little or no mischief in the corn-fields. While walking they frequently jerk their tail, and move with much grace, in the same manner as other birds of the genus. Their flight resembles that of the Red-winged species. An acquaintance of mine, residing in New Orleans, found one of these birds, a beautiful male in full plumage, not far from that city, while on one of his accustomed walks. It had been shot, but was only slightly injured in one of its wings, and as it was full of vivacity, and had a clear and brilliant eye, indicating that its health had not suffered, he took it home and put it in a cage with several Painted Buntings. They soon became accustomed to each other, the Grakle evincing no desire to molest its smaller companions. I saw it when it had already been caged upwards of four months, and had the satisfaction to hear it sing repeatedly. Its notes, however, were less sonorous than they usually are when the birds are at liberty. It frequently uttered its travelling chuck-note. It was fed entirely on rice. This was the only specimen I ever saw in captivity, and it proved a very amiable companion. 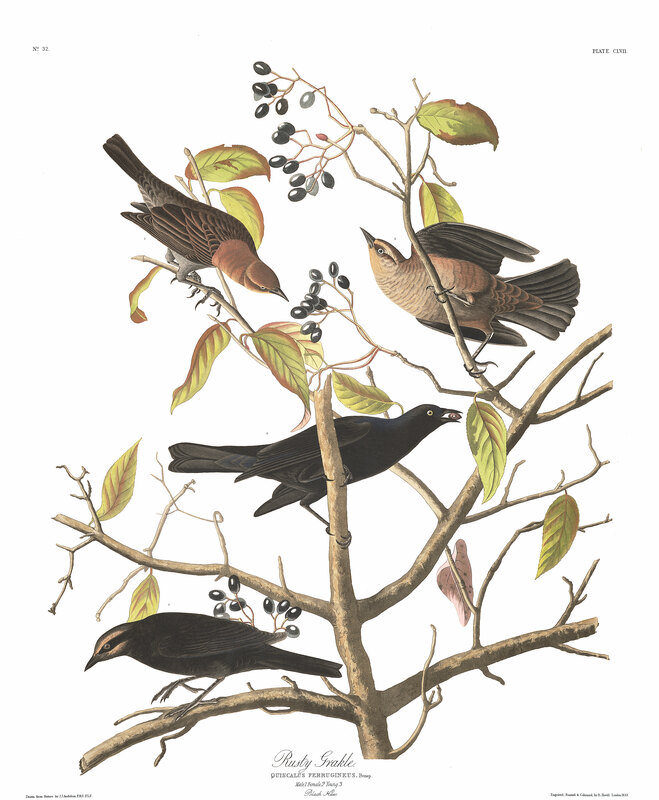 I have figured three of these birds, to enable you the better to understand their different states of plumage, and placed them on a plant of the genus Prunus, which grows in Louisiana, and on the berries of which they occasionally feed. This species is found on the shores of the Columbia river, and in all the districts intervening between them and those of the Gulf of Mexico, at least in winter and the early part of spring. Mr. TOWNSEND, who procured some on the Columbia, did not inform me whether it breeds there. Northward, according to Dr. RICHARDSON, its summer range extends to the 68th parallel, or as far as the woods reach, and it arrives in pairs on the banks of the Saskatchewan in the beginning of May. In that country it joins with the Redwings, Common Crow Blackbirds, and Cow Buntings, in committing depredations on the corn-fields. The eggs of this species measure one inch in length, five and a half eighths in breadth. Their ground-colour is pale blue, marked sparingly with blotches of brownish-black, and others more numerous of pale purplish-grey, the former disposed round the large end, the latter over the whole surface. RUSTY GRAKLE, Gracula ferruginea, Wils. Amer. Orn., vol. iii. p. 41. QUISCALUS FERRUGINEUS, Bonap. Syn., p. 55. SCOLECOPHAGUS FERRUGINEUS, Rusty Maggot-eater, Swains. and Rich. F. Bor. Amer., vol. ii. p. 286. RUSTY BLACKBIRD, Quiscalus ferrugineus, Nutt. Man., vol. i. p. 199. RUSTY GRAKLE, Quiscalus ferrugineus, Aud. Orn. Biog., vol. ii. p. 325;vol. v. p. 483. Male, 9 1/2, 14 1/4. From Texas to Maryland, and along the Mississippi and Ohio to Kentucky, during winter. Migrates northward to the Fur Countries, and to the Columbia river, in summer. Common. Bill of moderate length, straight, tapering, compressed from the base; upper mandible prolonged on the forehead, forming an acute angle there, a little declinate at the tip, the dorsal outline slightly convex, the sides convex, the edges sharp and inflected; lower mandible nearly straight in its dorsal outline, convex on the sides, the edges sharp and inflected; gap-line deflected at the base. Nostrils basal, oval, half closed above by a membrane. Head of ordinary size, neck rather short, body rather slender. Feet of moderate length, strong; tarsus compressed, with a few long scutella anteriorly, sharp behind; toes compressed, the lateral nearly equal, the outer united as far as the second joint to the middle, which is much longer, hind-toe not much stouter than the inner; claws rather long, arched, compressed, very acute. Plumage soft, blended, glossy. Wings rather long, second quill longest, first and fourth equal. Tail rather long, slightly rounded, of twelve broad feathers. Bill and feet black. Iris pale yellow. The general colour is deep black, with greenish and bluish reflections. Length 9 1/4 inches, extent of wings 14 1/4; bill along the back 3/4 along the edge 11/12; tarsus 1 1/4. Bill, iris and feet as in the male. The general colour is brownish-black; the sides of the head over the eyes, and a broad band beneath it light yellowish-brown, the feathers of the lower parts more or less margined with brownish. Length 8 11/12 inches, extent of wings 13 1/2. In a male preserved in spirits, the palate is slightly ascending, with two papillate ridges; the posterior aperture of the nares 5 twelfths long, margined with small papillae; the upper mandible beneath slightly concave, with three longitudinal ridges and four grooves. The tongue is 9 twelfths long, narrow, very thin, concave above, sagittate and papillate at the base, the tip slit and lacerated, forming two elongated points. The tongue is thus very different from that of the Buntings and Finches, which generally have it deeper than broad, and is similar to that of the Crows, Starlings, Thrushes, &c. The breadth of the mouth is 5 1/2 twelfths. The oesophagus is 3 inches long, its greatest width 5 twelfths, on entering the thorax contracting to 2 1/2 twelfths. The stomach is elliptical, rather large, 10 twelfths in length, 7 twelfths in breadth; the lateral muscles rather thin, the tendons large; the epithelium thin, dense, reddish-brown, longitudinally rugous. The stomach is filled with small seeds and insects, together with some grains of quartz. The intestine is 11 1/2 inches long, from 2 1/2 twelfths to 2 twelfths in width; the coeca 3 twelfths long, 1/4 twelfth in width, 10 twelfths distant from the extremity. The trachea is 2 inches 4 twelfths long, considerably flattened; its rings, which are firm, about 80, with 2 additional rings. Bronchial half rings about 15. Four pairs of inferior laryngeal muscles, which are large and well defined. In all the Quiscali, Icteri, and other birds of this group, there are slender salivary glands as in the Thrushes and Warblers, as well as the Finches and Buntings. PRUNUS NIGRA, Pursh, Flor. Amer. Sept., vol. i. p. 331.--ICOSANDRIA MONOGYNIA, Linn.--ROSACEAE, JUSS. Leaves deciduous, ovate, acuminate, unequally serrate, smooth on both sides; umbels sessile, solitary, few-flowered. This species of Prunus, which is tolerably abundant in Louisiana, the only State in which I have observed it, grows along the borders of the forest, and often attains a height of thirty or more feet. Its leaves fall at a very early period, but its fruits, which are pleasant to the taste, remain until after the first frosts, or until devoured by birds, opossums, squirrels, or racoons.